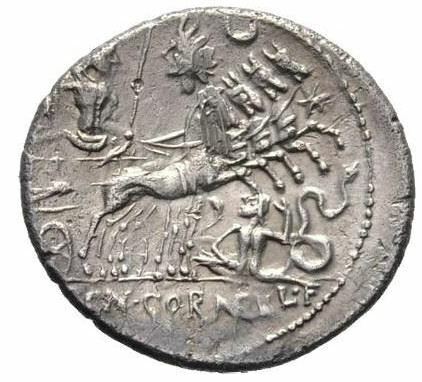 C. Cornelius L.f. Sisenna was a moneyer who struck coins between 118 BC and 107 BC. His coins are quite rare. Gens Cornelia was one of the greatest patrician houses at Rome. For more than seven hundred years, from the early decades of the Republic to the third century AD, the Cornelii produced more eminent statesmen and generals than any other gens. Nearly a third of all the consuls under the Republic were members of this family, beginning with Servius Cornelius Maluginensis in 485 BC. Together with the Aemilii, Claudii, Fabii, Manlii, and Valerii, the Cornelii were almost certainly numbered among the gentes maiores, the most important and powerful families of Rome, who for centuries dominated the Republican magistracies. The surnames Arvina, Blasio, Cethegus, Cinna, Cossus, Dolabella, Lentulus, Maluginensis, Mammula, Merenda, Merula, Rufinus, Scapula, Scipio, Sisenna, and Sulla belonged to patrician Cornelii, while the plebeian cognomina included Balbus and Gallus.